The new school year is around the corner! Help special learners soar, while becoming an IEP expert in our unique school-based position (don’t worry there’s on the job training too). 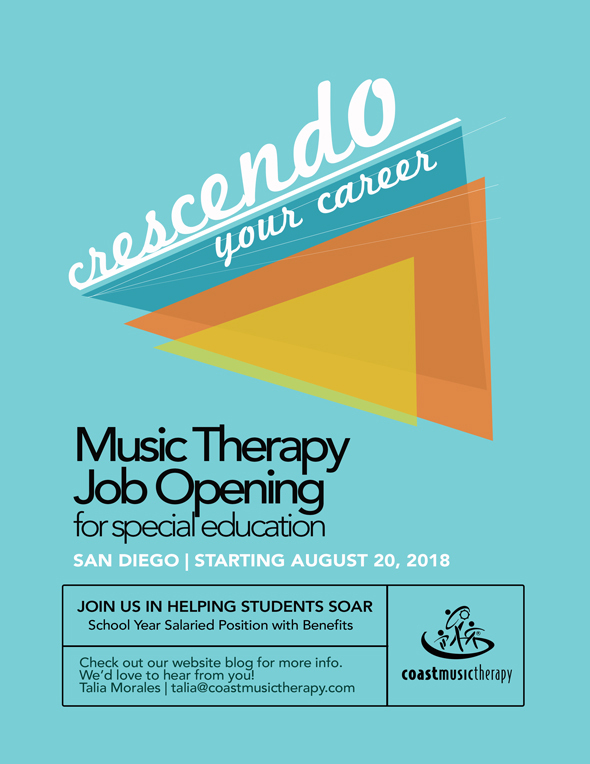 Join our close-knit, inspired team of Board Certified Music Therapists in sunny San Diego starting August 20, 2018. This full time salaried 10-month position, follows the school year calendar with big time benefits and tons of time off. This is an ideal position for adventure-bound therapists who like to travel, those of you have your own kiddos on a school year schedule, or the daring among you who enjoy diving into your own personal projects over the summer. We often have additional work available during summer school (late July and August) for those of you staying in town. Download our job flier here to share or post. 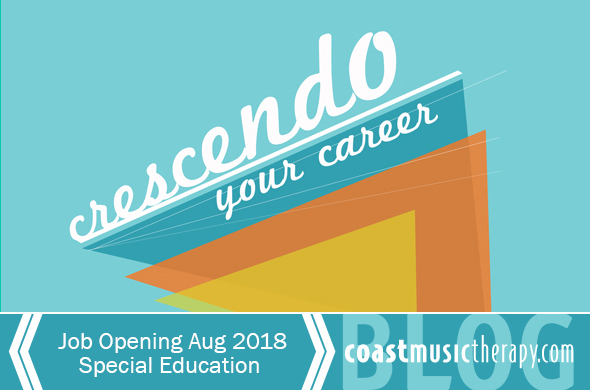 Description: Be a valued, integral part of the educational team and enjoy weekly time to connect with our creative crew of music therapists. You’ll have the opportunity to work with a diverse spectrum of disabilities, ages, and functioning levels. Hone your professional skills through individual and group sessions, co-treatment with teachers/SLPs/OTs/PTs, IEP meeting attendance, and progress monitoring. All of your documentation, meeting, and travel time is INCLUDED within your work hours (for both employees and contractors). Our therapists serve a variety of school sites Monday through Friday, primarily in the San Diego Unified School District and use our fully equipped office near Kearny Mesa as a home base. Weekends are always OFF for you time. Our full time school year position runs from August 20, 2018 through June 11, 2019, following the San Diego Unified traditional school year calendar. You’re then free for the summer, but Coast continues to cover your health and dental benefits if you’ll be staying on for the next school year! Many of our therapists use this time to work at summer camps, take on service projects abroad, enroll in summer courses, or chill with family. If we get along famously, the position automatically renews each school year, so you’ll return back the subsequent August when school starts again. Let us know if you’re interested in the option of providing summer school services! Depending on our student rosters, we may have an additional 4 weeks of work in July/August if you’re staying in town. Salaried 10-month therapists are eligible for over $8,000 in benefits!! – 28 additional paid days off (ALL school holidays)!!!!!!! Do the below describe you to a tee? If yes, get in touch with us ASAP. >>Passionate about helping students with autism and other special needs reach their potential. >>Outstanding organizational skills and impeccable follow-through. >>SUPERpowers on voice and guitar. Applicants must have a Bachelor’s or advanced degree in Music Therapy, MT-BC status (or taking exam within 3 months), reliable transportation, and must pass TB testing and a background check if hired (paid for by Coast Music Therapy).